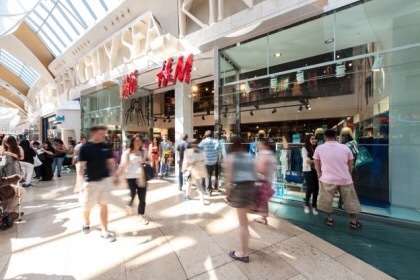 Fashion retailer H&M is to upsize its store at Kent’s Bluewater shopping centre as it looks to create a flagship store for the South East. The existing Bluewater shop will be increased in size to 40,000 square feet after incorporating an additional 15,000 square feet of space. The extra space will be used by H&M to showcase its full product range and will feature its collaborations with leading fashion designers such as Balmain. Due to open in November 2016, the statement store is being created by Land Securities building over Bluewater’s central service yard to create an enlarged upper floor and mezzanine. H&M will remain trading from its existing ground floor whilst the works are being carried out. The brand has also taken a unit on Bluewater’s lower Thames Walk, adjacent to House of Fraser, as a short-term menswear store. The H&M store is the latest in a series of upsizes at Bluewater such as Next’s new 44,000 square foot store on Thames Walkand Top Shop’s 30,000 square foot store on the upper Rose Gallery. The news follows a record-breaking 2015 for Bluewater during which time sales reached their highest level since the scheme opened. In addition, 22 brands committed to Bluewater in the year including Hackett, Nespresso, Breitling, Anthropologie and Tesla. Posted on January 29, 2016, in #retail, #uk. Bookmark the permalink. Leave a comment.